I have a weakness for pumpkin. It may be stronger than chocolate. When pumpkin season comes around I roast as much pumpkin as I can and freeze it for something pumpkin throughout the year. 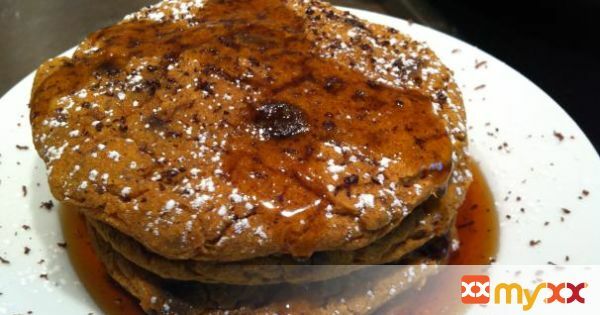 If you love pumpkin as much as I do you will love this recipe, and it will love you back by making this the easiest pancake recipe. No standing by the stove flipping pancakes while the kids are getting into who-knows-what. These sweet, moist, and full-of-pumpkin spice flavor are BAKED! An accidental recipe stemmed from mere frustration of feeling like the short-order cook. Serve it with maple syrup, powdered sugar, chocolate shavings, or all of the above. You will certainly be put into the best rock star category amongst the gang for this one. Enjoy! 2. Combine water, flax meal, and oil in a small bowl. 4. Sift all the flours, baking powder, baking soda, pumpkin spice, clove, set aside. 5. In a large bowl, add sugar, pumpkin puree. 6. Mix with a handheld mixer on medium speed until combined. 8. Add 1/3 of the coconut milk, repeat until all flour and milk has been blended. 9. Add the yogurt, mix until just combined. 10. With a mixing spoon, fold in chocolate chips until blended. 11. With a 1/4 cup sized bakers measuring spoon, spoon batches onto two parchment lined baking sheets or greased pans. 12. Use a smaller or larger measuring spoon for different sizes if desired. 13. Bake for 22-25 minutes or until a toothpick inserted comes out just a little moist. 14. Let it cool 2-3 minutes before serving.